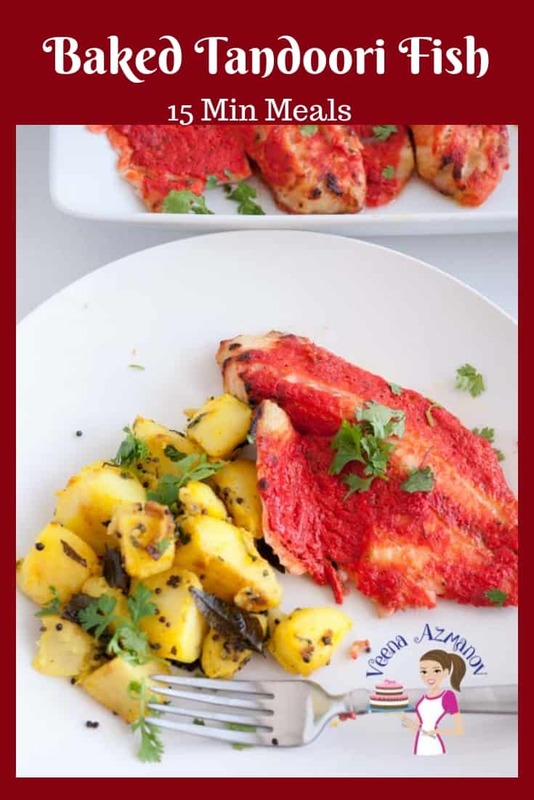 This baked Tandoori fish is a classic Indian recipe that is very popular among Indians and non-Indians also, and for a good reason. This simple, easy and effortless recipe is ready in about 15 minutes. It’s prepared with simple spices to flavor the fish and a yogurt marinade that keeps the fish soft, and moist. Tandoori actually means cooked in a special earth oven. A tandoor oven is a huge oven made of mud. It’s hollow on the inside and the temperature is hotter than any home or commercial ovens. Hence, those ovens require a special location. So we usually have to make do with our home ovens. And yet, if you ever do get an opportunity to try food made in a Tandoor, go for it! The taste is truly something you will not forget. We make fish often, at least once a week and this one is one of our absolute favorites. If you like fish made with bold flavors, most of all, if you like cilantro, you may also like to try my Cilantro Baked Fish. It is beautifully perfumed with the freshness of cilantro herb. And sometimes, I take a more delicate approach and use a breadcrumb crusted base with Parmesan and Cheddar. And if you looking for more fish ideas, take a look at my fish recipes. From simple pan-fried to bold tomato based flavors. Also, tandoori is not just for Chicken. The tandoori masala is a very versatile marinade and can be used for just about anything. The classic and probably most popular is, of course, the chicken tandoori. In addition, I also make fish or prawns. And I also make just veggies. I use it over cauliflower, potatoes, and turnips. Because this marinade really brings out the flavor of the main ingredient so beautifully! Fish – Personally, I think white fish fillet works best. So, I like to keep it as a fillet, and yet, you can also cut it into smaller chunks like the fish tikka. And you can also skewer these onto a barbecue skewer. The next time you are at an Asian / Indian grocery store, look for Tandoori Masala Powder. It’s a good mix of spices that are good to have around if you like cooking Indian food. Usually, these have a long shelf life. And yet, you can put them in a box and in the fridge so they stay fresh longer. For this recipe, we are not going to use store-bought tandoori masala. Rather, I use homemade tandoori masala. It is a combination of regular Indian spices that you can easily find like cumin, coriander etc. Yogurt – Traditionally Tandoori is made with yogurt. And yet, if you prefer you can also substitute it with two tablespoons of coconut cream to make this vegan or parve. The coconut cream will make sure the fish stays moist and creamy. Greek Yogurt – The purpose of using Greek yogurt is because it is thick and with less moisture. I remember my mom would take regular homemade yogurt, place it in a muslin cloth – place that into a sieve and let it sit for few hours so the excess moisture would drain out of the yogurt making it thick. Yet, nowadays we can fast forward that process using Greek yogurt. For a weekday lunch, I love to bake my tandoori fish fillet. And yet, often for a BBQ party, I will cut the fish into chunks, thread them onto skewers and grill them. If you haven’t tried grilled fish tandoori it’s absolutely delicious. And the caramelized yogurt dressing never tasted any better. Trust me. The fish fillets in the oven take about 15 minutes. And if you cut them into smaller chunks they should take not more than 7 to 10 minutes. Finally, the fish is properly cooked when it looks white, not opaque. If you plan to bake it, you will need an Oven. In summer the grill works great too. A mixing Bowl to combine all ingredients. Use glass or stainless steel. Never marinate in aluminium. Fish is delicate so use a Spoon to mix but use a flat spatula when working with fish or if you need to lift the fish carefully. I served these with my Spiced Indian Potatoes. Wash, clean and pat dry the fish. In a separate bowl – mix all the rest of the ingredients. Add the fish – let marinate. You can leave this to marinate for a few minutes to an hour or even overnight. Spray some cooking oil to avoid the fish sticking. Place fish on the oiled foil. Baked in the preheated oven – on the middle rack. Fish takes about 15 minutes to cook. 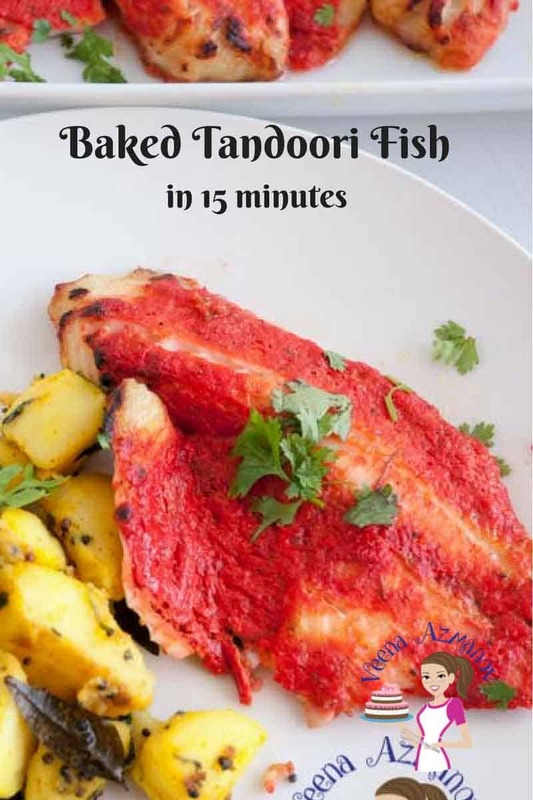 This baked Tandoori fish is a classic Indian recipe that is very popular among Indians and non-Indians also, and for a good reason. This simple, easy and effortless recipe is ready in about 15 minutes. It's prepared with simple spices to flavor the fish and a yogurt marinade that keeps the fish soft, and moist. In a separate bowl - mix all the rest of the ingredients. Add the fish - let marinate. You can leave this to marinate for a few minutes to an hour or even overnight. Baked in the preheated oven - on the middle rack. 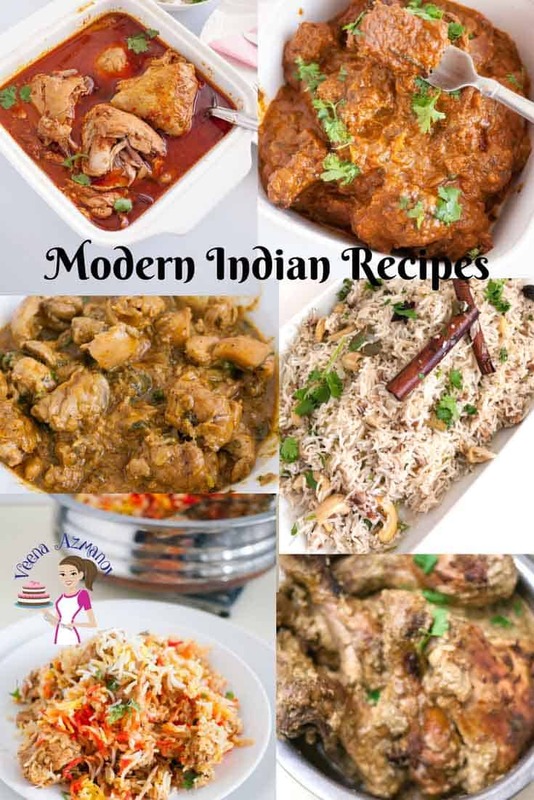 So you must check out some of my other Indian recipes from slow-cooked curries to quick and easy Indian Biryani and desserts. Thank you Eldridge. yeey! So happy you had enjoyed this recipe. Thank you ! And thanks for coming back to write this feedback. Have a wonderful day. The tandoori masala is so versatile. I remember using hung curd for marinating before the Greek yogurts came into existence. I am so thankful for them as it makes the job easier. So true Sandhaya.. I’ve done that too! I love that vibrant color! That will enhance anything you put it on. I have a tendency to dry out my fish when I bake it so the addition of the yogurt sounds intriguing! The Yogurt does help keep it moist. Fish works best for just 10 to 15 mins.. So yeah very sensitive. Looks easy and simple to make! I love the colors youve developed here!! And I always add yogurt to my chciken to keep it moist- great tip! Looks easy and simple to make! I love the colors youve developed here!! When I’ve finally got my own home with a garden, I want my own tandoor! I make naan at home and would love to make it more authentically. 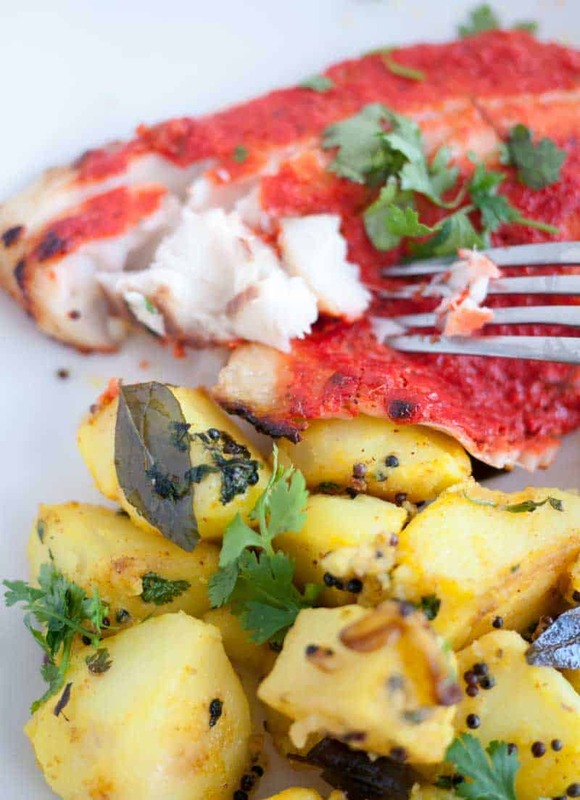 Tandoori fish is one of my favourites – I love the look of your recipe, I’ve been working on making my own tandoori spice powder and haven’t quite cracked it just yet but I will! Thanks JO… Now a days you get a small electronic Home Tandoor Oven..! it’s made with earthen material on the inside and metal on the out. Looks like a little drum. I saw it advertised some time back. You must look into it. 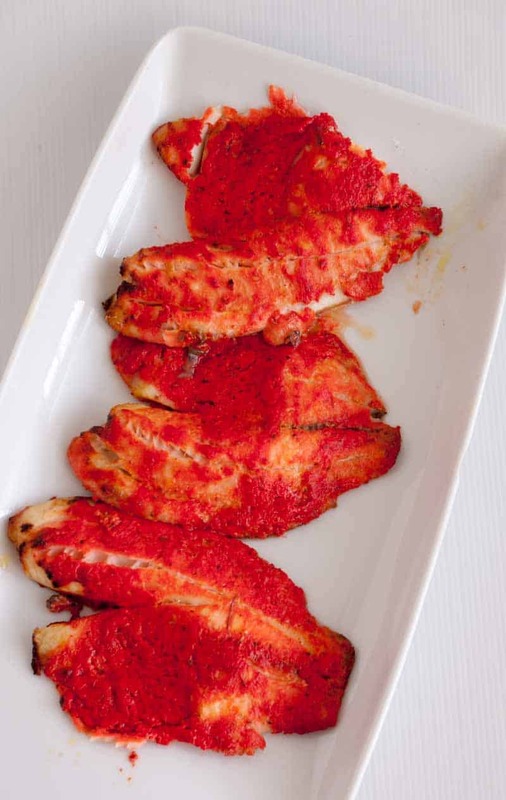 The bright red color of tandoori is always so striking – I had no idea it’s something restaurants use and it’s just color, not flavor! We love tandoori chicken and fish, so now I’m excited to try my own version at home, since I already have all these spices on hand. Yes a lot of people don’t realize it’s just color.. Often when I have guest over I try to use the color. Ppeople think it’s not tandoori without that color – conditioning..!! We do have clay bakers that would work with this dish. We eat fish several times a week so I’m always on the lookout for new and different recipes. I really like the flavors. We’ve used yogurt with chicken but never with fish. This will be an exciting first for me. I think you will love it Marisa.. this marinade is so versatile. This tandoori marinade sounds really good. I love all those flavors you’ve used in this. I also like to use greek yogurt in a lot of recipes so I’m sure this would be great! Yeah Greek yogurt just makes sure all the marinade stays on the fish rather than slide off..
Anvita I love Tandoori Aloo and Cauliflower too! Often I when I make Tandoori chicken I throw some veggies on the bottom of the chicken to catch the drippings..
Wow, Veena! The colour on that fish is gorgeous! It’s so inviting. The pictures are making me crave it right now. 🙂 I love the spice blend too. I’m assuming this would work well on any denser fish, right? Thank you Byron. I know you love Indian and I think you will feast over this..Absolutely any fish would work really.. I use prawns too!! We are lucky where we live and have many Indian restaurants that have real tandoori ovens. And those tandoori spices – just perfect. The tandoori fish looks great and I am looking forward to making it on the weekend. I’m going to look for the tandoori masala powder. A restaurant I love near me makes tandoori spiced tofu that’s my favorite. I’m always hesitant to cook fish, I never get it right, but this recipe looks so good I might have to give it another try! I also haven’t done too much Tandoori so it’d be an adventure for sure! I love finding new recipes for fish. 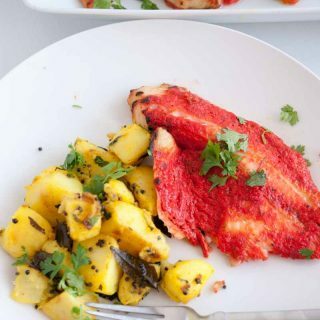 This tandoori fish looks amazing and will be added to my meal plan. Thanks! This recipe looks incredible! 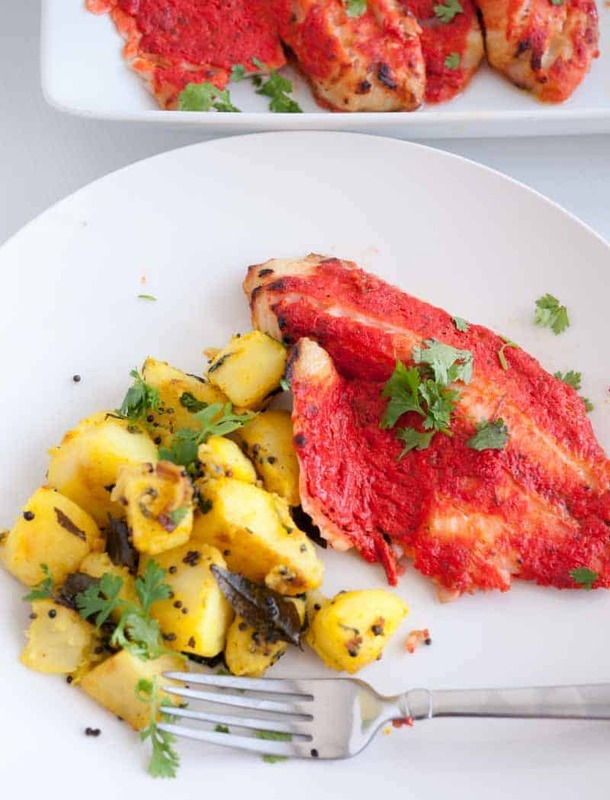 We eat salmon a lot, but I think it’s time to venture out and try something new like this Baked Tandoori Fish. Especially if it only takes 15 minutes! Yeah we eat mostly smoked Salmon a lot but our family favorite is baked fish! I love any type of meal that includes fish. Move over chicken, there’s a new sheriff in town!! I do agree though my kids would freak out if I took Chicken off the menu for more than a few days. This looks and sounds so flavorful! I love tandoori chicken so I bet I would enjoy tandoori fish. The red color is so bold! I had no idea tandoori meant earth oven, I thought it was a spice or a region. Yeah the color is edible but not necessary.. Yup tandoor use to in fact be huge.. earthen ovens.. I have had tandoori chicken but never fish. I love that this recipe can be made in 15 minute. What a great way to enjoy fresh fish with a great tandoori flavor. Absolutely Ali.. Love Tandoori Fish.. so easy and SO Simple.. I love homemade tandoori and I bet it’s great on fish. I’ve only used it on chicken at home but this looks amazing! Love the idea of the tandoor ovens. And I shall now look out for the Tandoori Masala spice mix. It sounds like something I need to try. Absolutely – must try Choclette!! This looks so easy! I’ve been thinking of trying tandoori marinade for a while, as I usually do a cajun marinade. I have greek yogurt, coriander and salmon in the fridge, so there’s no excuse now! Go for it Lizzie.. Enjoy! !